Oxygen (O2) gas detectors are used for or the detection of oxygen in rooms where changes of the oxygen concentration are possible, such as laboratories, hospitals and food productions etc. Alarm limits for decreasing concentration of gas is set to 18-19%. • Oxygen consumption due to breathing in dense areas. Problems usually arise in confined spaces such as tanks, tunnels, etc. The normally closed spaces like tanks, containers, pontoons, etc..
corrosion may have contributed to making oxygen levels drop to low values. A worker entering such an area may die immediately. Therefore, it is important to first check the oxygen concentration in the compartment. In some cases, other gases may be present, both toxic and explosive. Therefore it may be necessary to use a portable instrument that measures several gases at the same time. Before stepping into, for example, a tank you should check the oxygen concentration in the tank with a portable gas detector. In tunnels, such as sewers and other underground facilities the oxygen concentration may drop for various reasons. In addition, other, both explosive and toxic gases may have been formed as a result of biological reactions. For example, Methane (CH4), Hydrogen Sulfide (H2S), Carbon Monoxide (CO). An combustion engine underground may consume the oxygen and leave carbon monoxide behind. Leakage of different gases that are lighter or heavier than air, may lead to accumulation in different cavities. When someone enters into such a cavity without first checking gas concentrations with an instrument it may lead to immediate death. In cases where you want to monitor oxygen concentration in a room, It is important to bear in mind which gas that could displace the oxygen. Examples of gases that can displace oxygen, thereby causing suffocation are the inert gases, such as Nitrogen (N), argon, helium, carbon dioxide, used in various industrial processes, hospitals, etc. Important to mention here is that the fact that the carbon dioxide in addition to displacing the oxygen is also toxic itself. If there is leakage of, for example, krypton, which has a higher density than air and will sink, the oxygen detector should be placed low. 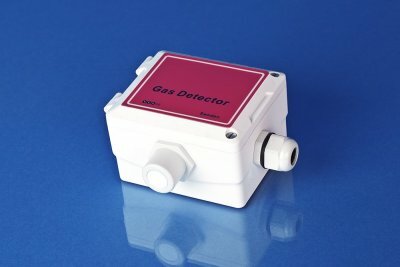 If a gas with lower density than air, such as helium, should leak, the oxygen sensor should be placed high. If the oxygen in a room risks being consumed by any form of combustion, the oxygen concentration will be reduced across the room which means that the sensor placement here is not as critical as in the above examples. If the oxygen concentration in the air increases, the risk of fire dramatically increases. All combustible products will be much more flammable. Inhalation of high oxygen concentrations over time can be harmful. Alarm limit is set at 23% O2.